We’d love your help. Let us know what’s wrong with this preview of The Aleppo Codex by Matti Friedman. To ask other readers questions about The Aleppo Codex, please sign up. The Aleppo Codex is a thousand year old manuscript originally created to help Jews properly interpret their religious texts. For the six hundred years prior to 1947, it resided in a synagogue in the Syrian town of Aleppo. In the riots following the vote to create the State of Israel, however, its secure home was breached and the book thought to be destroyed. The good news is that this priceless ancient book actually survived the riots. Today, 60% of it is in the hands of the Israeli government. W The Aleppo Codex is a thousand year old manuscript originally created to help Jews properly interpret their religious texts. For the six hundred years prior to 1947, it resided in a synagogue in the Syrian town of Aleppo. In the riots following the vote to create the State of Israel, however, its secure home was breached and the book thought to be destroyed. The good news is that this priceless ancient book actually survived the riots. Today, 60% of it is in the hands of the Israeli government. When he first started writing about the Codex, journalist Matti Friedman was under the common impression that the missing 40% was destroyed in the riot fires. But as he began looking into the history of the Codex in more depth, he discovered a story much more convoluted and sinister. In this book, Friedman traces the path the Codex took from its original grotto to its current home. Along the way, he considers which of the men in its path may not have cared for it as well as they should have and the battle for its ownership between the Aleppo Jews and the new government of Israel. My original brilliant review was lost due to post-storm internet issues, so here is a far less brilliant synopsis. The titular Aleppo Codex refers to what is probably the closest thing we have to an original bible. Written in 960, it includes the 24 books of the Hebrew bible with guiding notes on words that are written one way and read another or other ambiguities. Since its completion in 960, the Codex traveled around, was used by Maimonides, and eventually found its home for 600-something year My original brilliant review was lost due to post-storm internet issues, so here is a far less brilliant synopsis. The titular Aleppo Codex refers to what is probably the closest thing we have to an original bible. Written in 960, it includes the 24 books of the Hebrew bible with guiding notes on words that are written one way and read another or other ambiguities. Since its completion in 960, the Codex traveled around, was used by Maimonides, and eventually found its home for 600-something years in the Jewish community of Aleppo where it was ferociously guarded. Sadly, this precious book disappeared in the Aleppo riots of 1947 where it was rumored to have been burnt. Although the Codex eventually resurfaced in the state of Israel, its purity was tainted by both murky dealings and significant sections that mysteriously went missing. Friedman, a determined journalist and researcher, wrote this non-fiction book describing his attempts to get to the bottom of the various mysteries around what happened to the Codex since 1947. Although Friedman could not provide conclusive answers to all of the questions, he managed to accumulate an unprecedented amount of evidence and information relating to the dark lacunae around the Codex. Some of the reviews I read led me to expect a thriller which would immediately rope me in and keep me hanging on every word. Well, not exactly. This book was a bit of a slow burn for me as Friedman provided background and set up the situation. Although I've been more of a non-fiction fan lately, this is where fiction has the upper hand; an author who's sticking to the truth can't really make a story more gripping than it is. With that said, from about halfway in my curiosity began to intensify and I did find myself quickly turning the pages to see what I would learn next. The other advantage of fiction is that it can provide a sense of closure that's not always possible in reality. While I closed the book feeling like I knew a whole lot more about the Codex than I had previously, and even feeling like I could make some educated and distinctly plausible guesses about what had happened to it, none of us will ever really know which can feel a bit frustrating after all that investigation. This book is about an ancient and near-perfect transcription of the Hebrew bible from a thousand years ago; in the twelfth century Maimonides relied on it. It was spirited out of Jerusalem after the catastrophe of the first crusade, landed in Cairo and eventually in Aleppo. It remained in Aleppo for six centuries, where it became the treasure of the ancient Jewish community there--a community that predated both Christianity and Islam. There the book became known as the Crown of Aleppo. Then, as the fortunes of that community declined under the dominant Muslim culture, especially with the changes wrought by modernity, the Crown eventually became more of a talisman to be hidden and protected than a source of study. That remained its status until the end of the Aleppo Jewish community in its home environs. This book is a journalistic whodunit about how the book came to be the property of the new state of Israel rather than of the Aleppo Jews who emigrated to Israel or elsewhere, and, further, how it ended up short 200 pages from the first five books of the bible--the most important part. The official story, or, rather, the ones officials stick to, is that part of the Crown went missing after rioting that followed the UN vote that created the state of Israel. Friedman's investigative efforts support another version. His findings suggest that in the book was seen whole, or nearly so--more than once--in the interim before the book ended up in a museum in Israel, and that, ironically, the Aleppo codex remained intact for centuries in the lands of Islam and was decimated only after landing in the hands of those who were supposed to protect it. I went to see the movie The Post because of another book I've just finished, The Race Beat: The Press, the Civil Rights Struggle, and the Awakening of a Nation. But the movie surprised me by speaking to this book in the part at the end where Nixon is shown to have confused his own interests and his own status with those of the country. That reminded me what Matti Friedman writes about particular founders of Israel in their roles as both visionary political leaders and scholars: "For these men, the good of Israel, the good of science, and their own professional prestige were often inextricably muddled; (such men didn't hesitate) to use the government's power to pursue aims that often conflated the three." Then too, in those early years, Eurocentrism still reigned supreme. Along the way Friedman weaves together ancient and modern history. He tells us about the history of the Codex--the Crown of Aleppo--over the centuries and also about the personages protected the book during the riots and those who helped extricate the book from Aleppo in the 1950s as the community there was extinguished. He tells us about that community, what it was like, and also how, with the increasing involvement of Europeans in the Mideast, some Jews experienced social mobility. In context, that constituted uppitiness, or not knowing their place. The process of change in how the Aleppo Jewish community was seen morphed and accelerated after the events of 1948, eventually incorporating the entire community and ending in their being driven out. But the heart of this book is the whodunit. The book is perfectly serviceable as such. More than that, it's won awards, according to the book's Wikipedia page. It's just that I prefer a literary mystery or theological detective work. The book read well, like a novel. It had the feel of being well-researched but I always find real mysteries leaving me with more questions than answers. For those in the know about the Israeli academic scene, this book will also open up one's eyes to the underworld of some of the star players who are deceased. The Aleppo Codex was interesting. I didn't find it as riveting as my coworker did. It was the history of a missing sacred text for Syrian Jews. While the author was very good, I just didn't enjoy the material. If you have a penchant for Jewish history, this is definitely a must read. I give this book a 3.5. The Aleppo Codex is a 1000 year old manuscript written by Ahron ben Asher that is considered the most complete version of the Jewish people ever penned. For nearly 1000 years scholars studied the work and guarded it closely. After 1947 pages went missing. Friedman's work was to investigate those who were present at the time of the theft to find out where the missing pages are today. The reason why I didn't give this book a higher review is because of the writing. Friedman I give this book a 3.5. The Aleppo Codex is a 1000 year old manuscript written by Ahron ben Asher that is considered the most complete version of the Jewish people ever penned. For nearly 1000 years scholars studied the work and guarded it closely. After 1947 pages went missing. Friedman's work was to investigate those who were present at the time of the theft to find out where the missing pages are today. The reason why I didn't give this book a higher review is because of the writing. Friedman is a journalist and it shows. Most of the book is written like news articles and reads fast. He interviewed many members of the Aleppo community but instead of penning their oral histories for the most part we are left with sound bites. Thus, the book reads like a fast paced whodunit as opposed to a definitive history of the Crown of Aleppo. The Aleppo Codex is a thousand year old manuscript originally created to help Jews properly read the Torah. For the six hundred years prior to 1947, it resided in a synagogue in the Syrian town of Aleppo. In the riots following the vote to create the State of Israel, however, its secure home was breached and the book thought to be destroyed. The good news is that this priceless ancient book actually survived the riots and this books tells us how. The bad news is that the most important parts of The Aleppo Codex is a thousand year old manuscript originally created to help Jews properly read the Torah. For the six hundred years prior to 1947, it resided in a synagogue in the Syrian town of Aleppo. In the riots following the vote to create the State of Israel, however, its secure home was breached and the book thought to be destroyed. The good news is that this priceless ancient book actually survived the riots and this books tells us how. The bad news is that the most important parts of this book, including the entire Pentatuch portion [Genesis through Deuteronomy], went missing. Friedman takes us on an exciting, educational, and ultimately depressing hunt for those missing pages. It is indeed a page-turner but [spoiler alert], the mystery of those missing pages is never solved, although fingers are pointed at convincing targets, the very folks one would hope would never stoop to steal such an important piece of Jewish heritage. We read of at least three victims as we follow Matti Friedman’s quest to learn the facts behind the Crown of Aleppo, a version of the Hebrew Bible written before 1000 CE. When Friedman first sees it displayed in a secluded room at Israel’s National Museum in Jerusalem, he learns that very few of the pages are original. He sets off to learn more about it and finds much more than he anticipated. The book, considered by Maimonides, who lived in the twelfth century and considered, even today, to b We read of at least three victims as we follow Matti Friedman’s quest to learn the facts behind the Crown of Aleppo, a version of the Hebrew Bible written before 1000 CE. The book, considered by Maimonides, who lived in the twelfth century and considered, even today, to be one of the most important Jewish scholars in history, to be the best Codex of the Hebrew Bible available, had been stored and guarded in a synagogue in Aleppo, Syria, for more than a thousand years. The day after the United Nations voted to grant statehood to Israel in 1947, the Arabs in many Arab countries, including Syria, attacked the Jewish people and institutions, some of whom were in those countries since the destruction of the Second Temple in 70 CE. The synagogue where the Crown was protected was set afire and the Crown was thought to have been burnt. The truth, as discovered by Friedman, was that much of it had been rescued and smuggled into Israel a few years later. What happened to it there made it the second victim. The Syrian Jews, along with hundreds of thousands of the Jews in other Arab countries fled for their lives, taking only what they could wear or smuggle out with them. Jewelry and books were the main items. The Jews in charge of the Israeli government, as well as many of the residents, considered the Jews from the Arab countries to be inferior and treated them poorly. They took the Crown and many of the books, saying they would be returned later on or they could protect them better than the Arabic Jews (who had protected them just fine for more than a millennium) . Many of them were not returned to their original owners. Those Jews were the second victims. The third victim was the public, including scholars, who was not given access to look at or study this important document for decades. By that time, it was not in the same condition it had been when it was brought into the country. Matti Friedman used his journalistic training and skills to find out about the Crown and its journey. He traveled to several countries to speak to people who had direct knowledge and was told some truth but also a lot of lies and distortions. Many of them were contradictory. At the end the book, he presents his theory of the codex’s journey. Do you like a good mystery? Do you like “serious” books about things that actually happened? Do you have lots of commuting time? Well, these are three reasons you have to listen to this book! I decided to teach myself Biblical Hebrew a few decades ago, with the desire to see what the text did actually say, cleansed from all adaptations to Western tastes. This, plus my fascination for anything bookish, made this book really intriguing to me. I had no idea I was actually plunging into a real myster Do you like a good mystery? Do you like “serious” books about things that actually happened? Do you have lots of commuting time? Well, these are three reasons you have to listen to this book! I decided to teach myself Biblical Hebrew a few decades ago, with the desire to see what the text did actually say, cleansed from all adaptations to Western tastes. This, plus my fascination for anything bookish, made this book really intriguing to me. I had no idea I was actually plunging into a real mystery, still not completely resolved, and going for a really fascinating ride. I thoroughly enjoyed reading about this most interesting ancient and important book! What a fascinating history- I am surprised it is not more well-known. It was not a novel, but I don't think a person could've made up anything more interesting or twisted than this story! Well done Matti Friedman for his thorough research. I enjoyed reading about the Aleppo Codex itself and its history, I also enjoyed reading about the Jewish community that lived in Aleppo. However, I didn't quite believe the solution of the "mystery" of what happened to the codex, and the investigation leaves more questions than answers. I wanted to like this book, I really did, but I don't. The author is a journalist and many of the chapters are deadening facts and details thrown on the page, and by the end of the novel, I didn't walk away with an answer to the "mystery." While some of it was intriguing, I had to force myself to continue reading to the end....which is sad because I love reading non-fiction and Biblical type books. Not my cup of tea, but maybe it will be yours. Nooit gedacht dat een boek over een boek zo boeiend kon zijn! De auteur gaat op zoek naar het verhaal achter de Aleppo-codex en de verdwenen bladzijden daaruit, en doet dit op een indrukwekkende manier. Je leert het belang van De Kroon (zoals de codex ook wordt genoemd) kennen, en je krijgt inzicht in de joodse gemeenschap en de geschiedenis van het boek (voor zover die te achterhalen valt). Erg boeiend geschreven, het leest bijna als een -zij het dan waargebeurde- detective. Journalist Friedman peels away much myth and misinformation to tell the eventful and in many ways tragic true story of the People of the Book's most cherished physical book--the more than 1000 year old Aleppo Codex. This handwritten 10th century codex preserves the authoritative Masoretic version of the 24 books of Jewish Bible on parchment, in clear calligraphy, with vowel and cantillation markings and scholarly annotations. 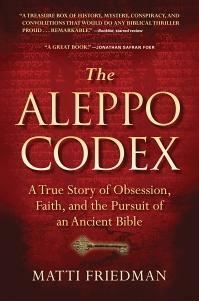 The Codex, produced by Aaron Ben Asher and colleagues in Tiberias, foun Journalist Friedman peels away much myth and misinformation to tell the eventful and in many ways tragic true story of the People of the Book's most cherished physical book--the more than 1000 year old Aleppo Codex. This handwritten 10th century codex preserves the authoritative Masoretic version of the 24 books of Jewish Bible on parchment, in clear calligraphy, with vowel and cantillation markings and scholarly annotations. 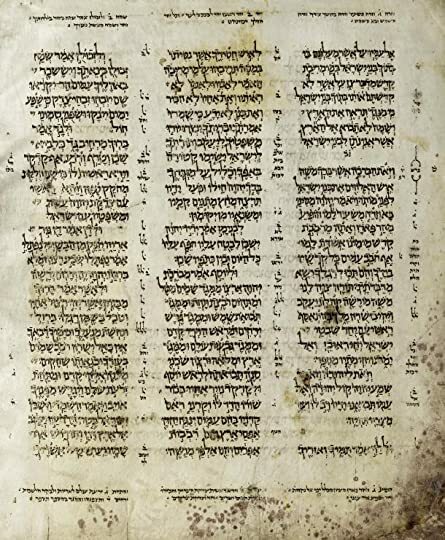 The Codex, produced by Aaron Ben Asher and colleagues in Tiberias, found its way from Tiberias to Jerusalem, where it was eventually plundered by the Crusaders when they captured the city around 1100. Egyptian Jews ransomed the Codex and brought it to Fustat, near Cairo. There, Maimonides utilized it as the source for his writings on the proper cantillation for the public Torah readings that are a key part of the cycle of Jewish communal worship. The Codex remained in Maimonides descendants' possession in Egypt until the late 14th century, when one of these descendants relocated to Aleppo in Syria. Aaron ben Asher and his colleagues intended the codex to be a resource for rabbis and scholars but for the next six centuries, the Aleppo Jews treated it like a holy relic. They locked it away in an underground chamber beneath their synagogue, as a talisman that had the power to protect them from persecution and other calamities. Because the Aleppo Jews believed that disaster would befall them if they let the Codex out of their hands, they resisted attempts by prominent Zionists in the 1940’s to bring it back to Palestine. In addition they forbade scholars from reproducing it. At this time, the Aleppo community was under threat because of Syrian nationalism and opposition to Zionism. Alas, at the time that Israel became a state, an anti-Jewish riot led to the gutting of the main synagogue in Aleppo and the Codex was believed burned. At this point, what happened exactly to the Codex is a tangled and murky story. The Codex actually survived—in fact, the Aleppo Jews had kept it hidden and eventually it was smuggled into Israel. There, Israeli president Yitzhak Ben-Zvi and his quasi-governmental Ben-Zvi Institute took possession of it, despite an outcry and an unsuccessful lawsuit from Aleppo emigrés, who insisted that it belonged to them. However, more than 1/3 of the Codex’s pages mysteriously turned up missing. Friedman makes an impressive effort and succeeds to some degree in getting to the bottom of what actually happened. Did greedy and/or superstitious Aleppo Jews pillage pages or whole sections from the Codex? Is skullduggery on the part of the Israel’s government and establishment--supposed rescuers and keepers of the Codex--to blame? Eventually, we get a partial answer to these questions and more, including revelations of a cover-up and informed speculation that points the finger at particular parties. It’s not a pretty story, or a simple one, and it constitutes a chapter in the larger story of arrogance on the part the 1950’s and 1960’s Israeli government elites. Despite efforts on his part to inject drama into the tale, Friedman manages to make the account of his investigations somewhat of a slog. Friedman the investigator is more of a virtuoso than Friedman the writer, with his cumulative “just the facts, ma’am” style of reportage. Only at the very end, as he sums up the tale, does Friedman let loose with an eloquent cri de coeur on behalf of this priceless but ill-treated cultural, religious, and scholarly treasure. This story comes to life in the audiobook. Published by Highbridge in 2012. Duration: 7 hours, 27 minutes. "The story of this book...should come as no surprise to any who have read it." I'm going to be brutally honest here. I picked up this audiobook on a lark. I thought it sounded like it was going to be interesting but I have a little pile of audiobooks and this one was quickly heading to the bottom of the pile because I was having a serious case of buyer's remorse. It loo This story comes to life in the audiobook. I'm going to be brutally honest here. I picked up this audiobook on a lark. I thought it sounded like it was going to be interesting but I have a little pile of audiobooks and this one was quickly heading to the bottom of the pile because I was having a serious case of buyer's remorse. It looked like a tedious bit of history and I was imagining a dry, boring lecture about an old book. I literally decided to listen to it just to get it out of the pile so I wouldn't have to dread listening to it any longer. Happily, I was very wrong about this book. In its roughest outline this is indeed a book about a very old book but it is much more than that. The story of the Aleppo Codex is told by Matti Friedman, an Israeli journalist through a variety of angles. Sometimes it is a mystery. Sometimes it is told as oral history. Sometimes the Codex itself is the prism used to look at Jewish history under colonial European rule or under Muslim rule in Medieval times or to look at the centrality of the Hebrew Bible, especially the Torah (the first five books) to the Jewish people throughout history. The Aleppo Codex is the most perfect copy of the Hebrew Bible that was written by hand. It is not fancy, but it is precise and neat and it was created a thousand years ago. 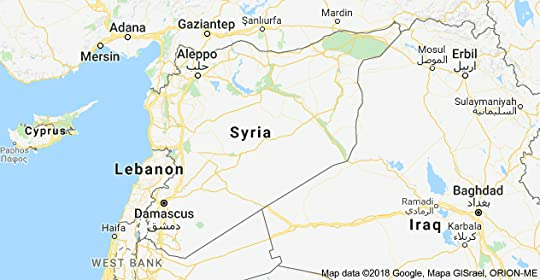 Over the centuries it has traveled here and there, surviving the sack of Jerusalem in one of the Crusades, re-surfacing in Egypt to be consulted by the famed Jewish scholar Maimonides and eventually working its way to the Jewish community in Aleppo, Syria. The Aleppo Jews treasured it and locked it away until an anti-Israeli riot broke out in Aleppo in 1947 and the Codex was scattered around the ruins of the synagogue in which it was stored. By the late 1950s the Codex was working its way to Israel and eventually to the Shrine of the Book where it sits on display. I love nothing more than a great book about a great book--and that is exactly what "The Aleppo Codex" is. "The Aleppo Codex" tells the story of one investigative journalist's dive into the politically-charged crossroads where ancient texts, book smuggling, the black market and religion all meet. The Aleppo Codex itself, also known as The Crown of Aleppo, was considered the most perfect copy of the Hebrew Bible, prior to it's round-world adventure from Syria to Israel, the United States and beyon I love nothing more than a great book about a great book--and that is exactly what "The Aleppo Codex" is. "The Aleppo Codex" tells the story of one investigative journalist's dive into the politically-charged crossroads where ancient texts, book smuggling, the black market and religion all meet. The Aleppo Codex itself, also known as The Crown of Aleppo, was considered the most perfect copy of the Hebrew Bible, prior to it's round-world adventure from Syria to Israel, the United States and beyond. Journalist and literary-detective Matti Friedman follows the mysterious trail of this manuscript, which was smuggled from its original hiding place in Aleppo, Syria--a synagogue that was burnt down during violent protests that racked the city of Aleppo and Syria as a whole. The manuscript travels to the newly-formed state of Israel under the protection of a Jewish cheese merchant--but not before some of its most valuable pages are stolen; concealed in the pockets and prayer shawls, hidden in closets and beneath the floorboards, of some of Aleppo's rabbis and lay residents. As writer Friedman learns, the secrets and politics surrounding the Aleppo Codex are only just beginning as the manuscript travels from Syria to Israel. Once in Israel it sparks a bitter fight between the government of Israel and the traditional religious community of Aleppo. Parts of the manuscript are discovered worldwide--black market sales that send portions of the Codex throughout Israel and the United States, South America and beyond. THE ALEPPO CODEX: A True Story of Obsession, Faith, and the Pursuit of an Ancient Bible. (2012). Matti Friedman. ****. The Aleppo Codes (book) was considered to be one of the most truthful renderings of the Torah and subsequent books of the Bible. It was used by Maimonides in his biblical work and studies. It is believed to have been composed in about 1100 A.D. It was kept secure in a special alcove in the temple at Aleppo, in Syria. In 1947, after the United Nations approved the partition of Pa THE ALEPPO CODEX: A True Story of Obsession, Faith, and the Pursuit of an Ancient Bible. (2012). Matti Friedman. ****. The Aleppo Codes (book) was considered to be one of the most truthful renderings of the Torah and subsequent books of the Bible. It was used by Maimonides in his biblical work and studies. It is believed to have been composed in about 1100 A.D. It was kept secure in a special alcove in the temple at Aleppo, in Syria. In 1947, after the United Nations approved the partition of Palestine into Palestine and Israel, rioting occured in the city, and Jewish businesses and temples were raided and looted by Syrian nationals. During the process, it was believed that the Codex was burned. Parts of it were rescued from the riot-torn Jewish quarter, however, and were later sent on by courier to the new land of Israel. It was discovered, then, that about two-hundred pages of the 500-page document were missing. When did they disappear? Who had them? This book traces the flight of the Codex from Syria to Israel and the multitude of people through whose hands it passed. The value of the document cannot be estimated, it is that basic to the Hebrew religious practices. The author has done his homework and at the end offers his solution to the problem based on the best intelligence around. This book provides an excellent detective story as well as an introduction to Jewish practices through the ages. Recommended. The Aleppo Codex is about sacred scripture that is owned and protected by the Aleppo community. As WWII rages and Jews are being taken to the camps, there is also destruction of of synagogues. The Aleppo Community sends it the the Israel. The newly established Israeli government wants the document for them self not going the Aleppo rabbit in Jerusalem. The Aleppo Codex ws very well written. Novel was not only about the path taken by the Aleppo The good of the State of Israel was considered more i The Aleppo Codex is about sacred scripture that is owned and protected by the Aleppo community. As WWII rages and Jews are being taken to the camps, there is also destruction of of synagogues. The Aleppo Community sends it the the Israel. The newly established Israeli government wants the document for them self not going the Aleppo rabbit in Jerusalem. The Aleppo Codex ws very well written. Novel was not only about the path taken by the Aleppo The good of the State of Israel was considered more important than the rights and needs of the community. This still occurs today. It is evident that many government, agencies and Churches believe that the beliefs, dogmas and needs of the whole out weigh the rights, needs, beliefs of the individuals that make up that umbrella group. Loved this book, I recommend it highly, if you want to know more about the Aleppo Codex, the Jewish Aleppo community. What happened to this highly sacred Crown. Why was everyone after this book. Israel was suppose to keep for safekeeping. All of sudden 200 pages are missing. Why was there a cover up? What community owns history? Or doesn't. Matti Friedman a journalist, kept us guessing. My only complaint at times he kept repeating the same thing, over clarifying, several times. I wanted to jump Loved this book, I recommend it highly, if you want to know more about the Aleppo Codex, the Jewish Aleppo community. What happened to this highly sacred Crown. Why was everyone after this book. Israel was suppose to keep for safekeeping. All of sudden 200 pages are missing. Why was there a cover up? What community owns history? Or doesn't. Matti Friedman a journalist, kept us guessing. My only complaint at times he kept repeating the same thing, over clarifying, several times. I wanted to jump to the author and ask why. But, still I highly recommend. Our Rabbi, in the next couple weeks will be collaborating with The Jewish Grand Strand Reads. What a mystery! First time I realized that Jews can persecute other Jews. And I never thought about a people with no country, no capital, no library of congress, where do they house their important papers and documents? What happens in time of war and conflict? A story that reflects on religion, history and document conservation. Intriguing study of the fate of one of the most revered Hebrew manuscripts of the Middle Ages--reads like a thriller combined with a solid academic investigation. If you want to know exactly what the Bible really says, the Bible Jesus knew, then you can’t rely on the King James Version (Thou shalt not kill. Thou shalt not commit adultery. Thou shalt not steal) or any other English translation. Nor can you rely on the Latin Vulgate (non occides non moechaberis non furtum facies) on which that is based, or even the Greek Septuagint (οὐ μοιχεύσεις.— οὐ κλέψεις.— οὐ φονεύσεις) which the Latin translators used. You need to go all the way back to the ori If you want to know exactly what the Bible really says, the Bible Jesus knew, then you can’t rely on the King James Version (Thou shalt not kill. Thou shalt not commit adultery. Thou shalt not steal) or any other English translation. Nor can you rely on the Latin Vulgate (non occides non moechaberis non furtum facies) on which that is based, or even the Greek Septuagint (οὐ μοιχεύσεις.— οὐ κλέψεις.— οὐ φονεύσεις) which the Latin translators used. You need to go all the way back to the original Hebrew לא תרצח לא תנאף לא תגנב. Fortunately, the Hebrew scriptures have been meticulously copied and available somewhere on this planet ever since they were first written. Unfortunately, they are written without vowels or punctuation, and the reader must be sufficiently familiar with all the vocabulary to know how to pronounce what’s on the page. To complicate things further, the last native Biblical Hebrew speaker died over two thousand years ago. The oldest known codex was written nearly eleven centuries ago by a Tiberius scribe named Shlomo Ben Buya. When the Crusaders sacked Jerusalem and hundreds of Jews were massacred and thousands of holy books destroyed, the codex was taken to Egypt for safe keeping. There it was used as a reference by the brilliant Sanish-born Jewish philosopher, theologian, physician and preeminent scientific mind of the middle ages, Moses Maimonides, also known as Musa ibn Maymun al-Andalusi al-Isra’ili, when he wrote his definitive work of Biblical study. A few centuries later, it was taken to Aleppo in Syria, where it was kept in a carefully guarded, double-locked iron safe in a grotto at the great synagogue for 600 years. Then, in 1947, when the United Nations voted to partition the former British mandate of Palestine into two new states, one Arab and the other Jewish, anti-Jewish riots broke out across the Arab world from Yemen to Morocco. Homes, businesses, and synagogues were looted and burned, and hundreds of thousands of Jews fled for their lives, taking whatever valuables they could. Aleppo was no exception. The precious thousand-year-old handwritten Aleppo Codex was somehow hidden away and smuggled out of the country. Ten years later, it had finally made its way back to Jerusalem, where sections of it are safe in a museum. Other sections were lost (stolen, damaged in the 1947 fire, or having otherwise somehow disappeared). In The Aleppo Codex: A True Story of Obsession, Faith,and the Pursuit of an Ancient Bible, Matti Friedman, a Jerusalem journalist, has written an exhaustive factual account of this priceless book’s travels and tribulations, combining elements of history, mystery, and espionage. He struggles to uncover evidence nobody seemed willing to release, including the transcript of a 1958 trial. His investigation takes him to five continents, and he slathers his narrative with every element of suspense, including fading memories of elderly principal characters, international smugglers, wheelers and dealers, scholars, government bureaucrats, a brown suitcase, some purple stains, false hotel records, tight-lipped officials, and even an unexplained death. Friedman includes a “Dramatis Personae” and plenty of interesting illustrations. What he does not include is any theological discussion, so even an atheist who has no interest in what the Bible says should have no trouble with the book. I am a history geek and seminary graduate, and I really enjoyed The Aleppo Codex. It's well-researched, well-written, and enlightening. It provides an excellent historic context for understanding today's Middle Eastern conflict, as well as reveals aspects of the Jewish diaspora and state's early government that help me comprehend tensions in the region by adding layers of detail. I've read extensively about the formation of the State of Israel—both contemporary and historic accounts—and this book I am a history geek and seminary graduate, and I really enjoyed The Aleppo Codex. It's well-researched, well-written, and enlightening. It provides an excellent historic context for understanding today's Middle Eastern conflict, as well as reveals aspects of the Jewish diaspora and state's early government that help me comprehend tensions in the region by adding layers of detail. I've read extensively about the formation of the State of Israel—both contemporary and historic accounts—and this book brings missing puzzle pieces to my understanding of the Middle East as it exists now. A somewhat depressing yet captivating piece of investigative journalism about the most ancient and perfect manuscript of the Hebrew bible and its journey from Aleppo to Jerusalem. While the official account is simple and straightforward, Friedman reveals that the true story is anything but. Every time the story seems to slow down, Friedman peels away another layer of intrigue and deception. Along the way, readers are treated to fascinating glimpses of Jewish history from the Tiberias of the sage A somewhat depressing yet captivating piece of investigative journalism about the most ancient and perfect manuscript of the Hebrew bible and its journey from Aleppo to Jerusalem. While the official account is simple and straightforward, Friedman reveals that the true story is anything but. Every time the story seems to slow down, Friedman peels away another layer of intrigue and deception. Exceptionally well written. A fascinating story of a vastly important yet little know book about the Hebrew bible. Lots of people, people , places, and events kept in a an understandable and very readable text. Matti Friedman is an Israeli Canadian journalist and author. Between 2006 and the end of 2011, Friedman was a reporter and editor in the Jerusalem bureau of the Associated Press (AP) news agency. During his journalistic career, he also worked as a reporter in Egypt, Morocco, Lebanon, Matti Friedman is an Israeli Canadian journalist and author. Following the 2014 Israel–Gaza conflict, Friedman wrote an essay criticizing what he views as the international media's bias against Israel and undue focus on the country, stating that news organizations treat it as "most important story on earth." He cited the fact that when he was a correspondent at the Associated Press (AP), "the agency had more than 40 staffers covering Israel and the Palestinian territories. That was significantly more news staff than the AP had in China, Russia, or India, or in all of the 50 countries of sub-Saharan Africa combined. It was higher than the total number of news-gathering employees in all the countries where the uprisings of the 'Arab Spring” eventually erupted... I don’t mean to pick on the AP—the agency is wholly average, which makes it useful as an example. The big players in the news business practice groupthink, and these staffing arrangements were reflected across the herd." Israeli newspaper Haaretz reported that the piece went "viral" on Facebook. The Atlantic then invited Friedman to write a longer article.